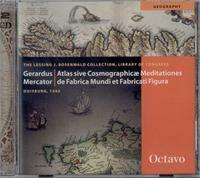 Gerardus Mercator’s Atlas is the greatest work of a man who revolutionized cartography. “Mercator’s Projection,” a new and vastly more precise method of mapping, has immortalized the Flemish geographer and instrument maker. His other great innovations involved simple terminology: the word “Atlas,” after the Titan who held up the universe, here first applied to a collection of world maps (and one of the very few examples of Renaissance allegory to survive in our modern vocabulary), and application of the name “America” (1538) for the entire New World – Waldseemüller before him (1501) had restricted the term to that portion (South America) actually visited by Amerigo Vespucci. The first two parts of the Atlas were published in 1585 and 1589: they covered France, the Netherlands, Germany, Italy, and the Balkans. The third and final part was left unfinished on Mercator’s death; his son completed the work. This Octavo Edition reproduces the first collected edition, from a beautifully hand-colored copy, bound in contemporary calf, and features the first publication of a complete English translation of the text.